Vetrotec has always set its sights on quality and now even facts prove this! 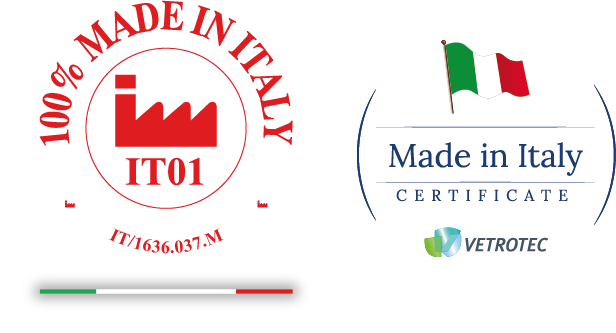 Our company has obtained 100% Made in Italy certification, a very important objective that confirms even more value for our products. – The confirmation of the product’s value and its Italian origin and high-quality. – Makes the products appealing and provides a guarantee to consumers. – Highlights real Made in Italy products in relation to partially made-in-italy or completely foreign productions. The certification of a production entirely Made in Italy through the 100% Made in Italy trademark allows to be recognised in the world for the superior guaranteed quality of products with attention to details. This trademark synthesizes the recognised features of Italian creativity, style and productions.